The group has been well received, allowing both academics and lay persons a glimpse into the comic mindset of 15th-17th-century Western Europe. 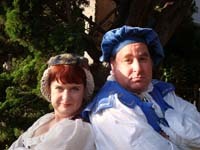 The plays are performed in authentic and well-researched costumes and styles for the late medieval and early modern eras. They feature simple props and staging, in the way "portable" short comedies typically would have been brought before the public in these periods. 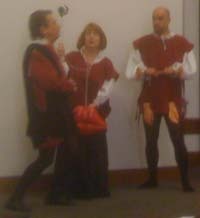 The group's name is a (terrible) pun on "Les Enfants Sans Souci", the medieval French organization known for its performances of comic plays (especially sotties). Our ad-hoc theatrical group may or may not be "carefree", but we are indeed kids (at heart) "without shelter", with no playhouse to use as home base. Besides California, we've performed in New York, Arizona, Spain, and Germany. We've never even had a website until recently! The plays are excellent mirrors of the popular concerns, trends, and issues of their time, and offer useful and humorous balance to other studies of these eras. The entertainments serve to remind us that human tastes in amusement and recreation have changed very little, even across five or more centuries. We stage one to two productions per year and are constantly expanding our repertory. For more information, please contact the director of LESA.